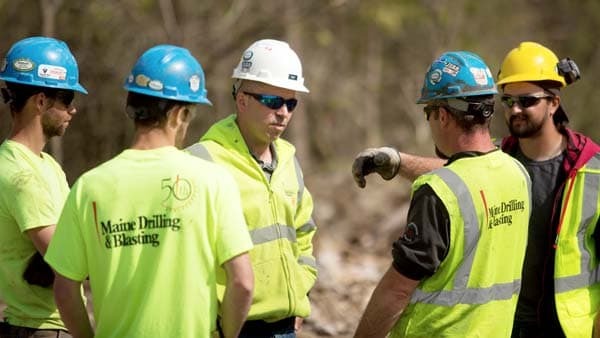 Each month, Maine Drilling & Blasting internally recognizes projects for achieving the highest safety standards integrated with operational excellence, often in the face of unique, difficult, and/or multi-dimensional challenges. The intent of this program is to promote and develop a consistently high standard for the entire Maine Drilling & Blasting Team. Receiving one of these Job of the Month Awards happens only with careful attention to detail and the willingness to set a higher standard. Recognized projects demonstrate the pride and integrity of our co-workers in their work, as seen through their eyes, and the eyes of management, and our customers. Nominations come from within the Company, through detailed applications that attest to the project meeting our organizational criteria. Our customers' satisfaction is key, so an important part of the application is a customer statement, to ensure that the project was not only a success for MD&B, but also for our customer. We're proud to share customer statements regarding some select job of the months. Doug, Kevin, and the crew have impressed again! MD&B was faced with many challenges this month due to the mass cut up against the highway, two pre-splits, and limited time to shoot. Todd set his men on-site up for success, and Doug and the crew took care of the rest. 67 total shots to date (3-18-19) and no issues. I wouldn't want anyone else on a RJG site with these conditions. Great work by all. On behalf of Sargent Corporation, it is my pleasure to recognize Maine Drilling & Blasting's crew for their work on the Rangeley Airport project. Nick managed the blast site in a very organized, efficient and most importantly, safe manner. The time frame of the project created a good opportunity for work during the time of year that is typically slow. With this opportunity also came some very challenging conditions to work through. His crew put in many long days through the harsh temperatures, snow and wind that come with a Maine winter. Nick did a great job of communicating with me throughout the project. I believe we worked well together to develop a plan that would accommodate a productive site for both MD&B and Sargent Corp. The large volume of material being moved each day required constant analysis and adjustment. The ability for Maine Drilling & Blasting to adapt to changing conditions was a real asset to the job. I had complete confidence in Nick that his decision-making was based on what was needed for the project to be successful for us as a team. Maine Drilling & Blasting's commitment to providing us with the quantity and quality of material needed was very much appreciated. There have been multiple areas of this Hanover 9 project which have required a unique and challenging outlook by your team and ours. Together we have been able to supply every demand required on the job in a safe and proficient manner. MD&B has always been a pleasure to work with on this particular job and many others in the past! Thank you for your continued effort. I wanted to take a minute to thank you for the work that your crew performed on the Maine Housing Project at 477 Minot Avenue in Auburn, Maine. Like all projects, this one had its challenges, and like always MD&B worked through the challenges to provide Gendron & Gendron with a quality product that was done safely, efficiently and ahead of schedule. One of the biggest challenges on this project was the elementary school that abutted it. Due to the project design and the existing ledge profile, we needed to blast within 100 feet of the school. This work was completed safely and without issue. I feel that this speaks to the effort that was put in by all involved parties from MD&B, from the start of the pre-blast survey all the way through to the crews in field. The other major challenge on this project was working around an existing gas main. The crew from MD&B worked hand in hand with the gas company to ensure that they had a high confidence level in the work that MD&B was performing. This was achieved through onsite meetings with all involved parties, use of a seismograph, and limiting the blast size to minimize disruption, which wouldn't be possible if MD&B didn't have qualified and experienced staff. We feel that this project was a success and we look forward to working with Carl, Trevor and all of the other MD&B employees again in the near future. There were approximately 40,000 cubic yards of ledge removal in this Phase I winter work. Nate, the Supervisor, and Ben, the Lead Driller, were great to work with, and helpful with schedule and planning to get completed on time. Can't wait to work with them again! Your boys did a good job yesterday. Dennis has done a good job for us. All our pit superintendents would probably agree also. Thanks! Our name says Maine because that's where we started over 50 years ago. But our experienced teams are local. We live and work nearby.